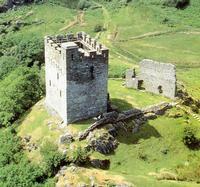 Dolwyddelan Castle is unusual within Wales. In a land of castles, Dolwyddelan stands apart not as a stronghold erected by Norman or English forces but as a fortress of the native Welsh princes. The castle occupies a magnificent location deep in Snowdonia, on a ridge set against the rugged backcloth of Moel Siabod. It was built between about 1210 and 1240 by one of Wales's most powerful medieval princes, Llywelyn the Great, ruler of Snowdonia. Llywelyn's stark and functional square tower, which can be seen for miles around, controlled a strategic pass through his mountainous kingdom from Merioneth to the Vale of Conwy. The core of the castle, the rectangular stone keep, was supplemented later in the 13 century by a stone curtain wall enclosing the courtyard. If the battlements and wall walks look a little too perfect for such a weatherbeaten spot, it is because they were restored in Victorian times. Dolwyddelan, a key mountain stronghold, saw active service in the late 13 century wars between the Welsh and Edward I. It fell to the English forces in 1283 and was refortified, probably with a second rectangular tower which today stands in ruin. A visit to this solitary sentinel is worth it for the views alone - the sweeping mountain vistas visible from its battlements are truly stunning. A470(T) Blaenau Ffestiniog to Betws-y-coed road.